Your child can start developing good reading habits at home before he go to school. How? Finding Alphabet from A to Z 2. A Preschool alphabet adventure picture ebook. Get your child to start reading by finding ABC together with a lot of interesting fruits. In this book, follow the little ant for the fruit quest. Find the alphabet on the way with fruits from A to Z. Apple, bananas, cherry, ... At the end, you can start all over again to find the little fly. 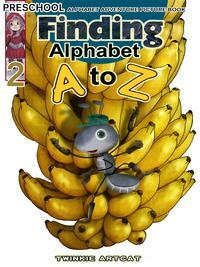 A book to help children learn to identify alphabet A to Z. A nice an colorful preschool reading ebook with 26 full color drawings and others. A total of 43 1024x1365 pixel drawings. Fun and easy to read.